CAR-T cell therapy has recently arisen as an exciting and innovative therapeutic modality. A wave of new biotechs have been established, several hundreds of clinical trials are underway, and multi-billion-dollar acquisitions have occurred. Despite rapid scientific and clinical advancements, Medicare reimbursement during these initial launch years has been underwhelming, particularly in the in-patient setting where CAR-T therapies are most frequently used. 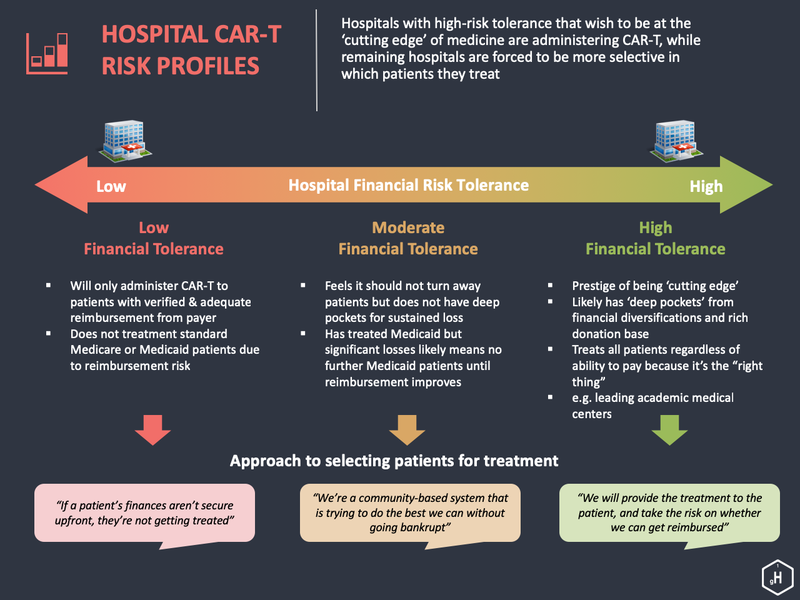 To characterize the reimbursement challenges to CAR-T therapy today, we spoke with Payers who are covering these therapies, and Pharmacists and Finance VPs at medical institutes providing CAR-T therapies. We found that inadequate reimbursement coverage for Medicare beneficiaries has led to hospitals with significant financial resources needing to subsidize treatments, while other institutions are not able to provide treatment. 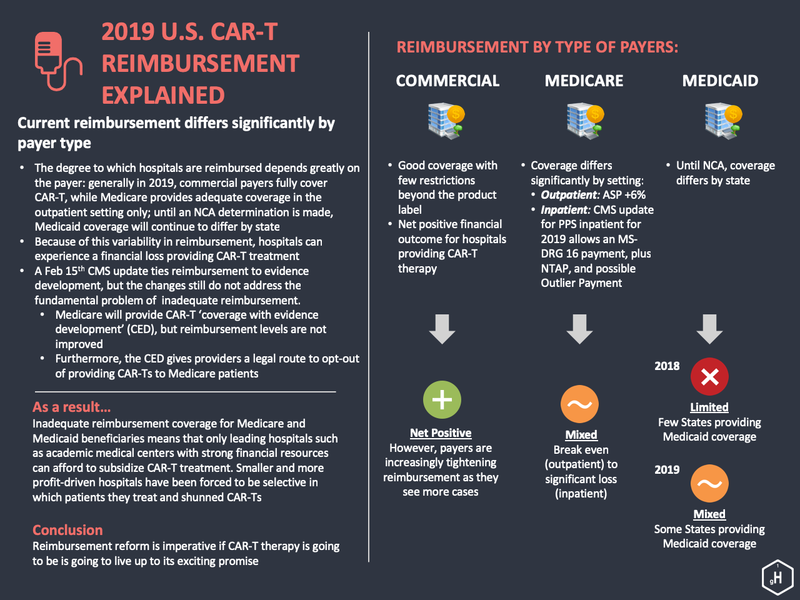 We believe that the recent CMS announcement (Feb 15th, 2019) that ties coverage to evidence development may prove to be too burdensome for some providers and could provide a legal route for providers to opt-out of providing CAR-Ts to Medicare patients. 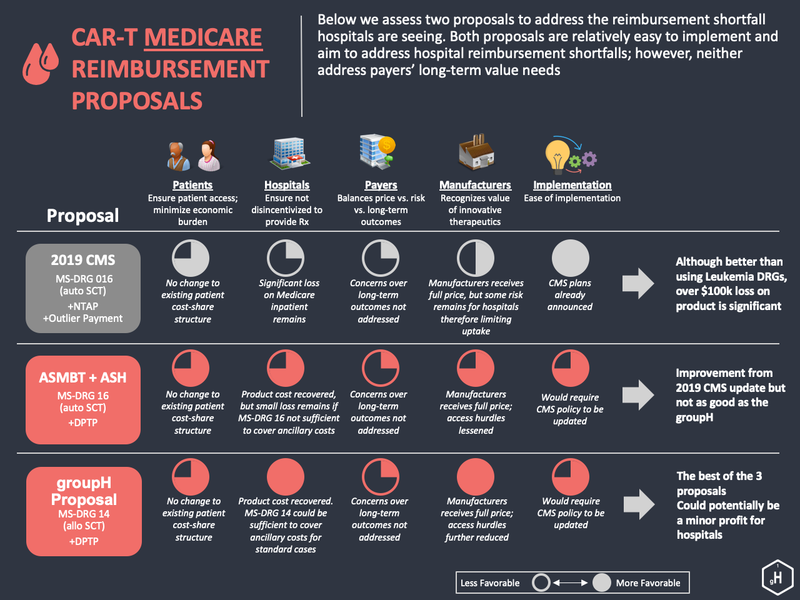 In our white paper presentation, we explore some of the reimbursement solutions that have been proposed by the American Society of Bone Marrow & Transplantation (ASBMT) and the American Society of Hematology (ASH) and assess how these proposals meet the needs of Patients, Providers, Payers, and Manufacturers and their ease of implementation. 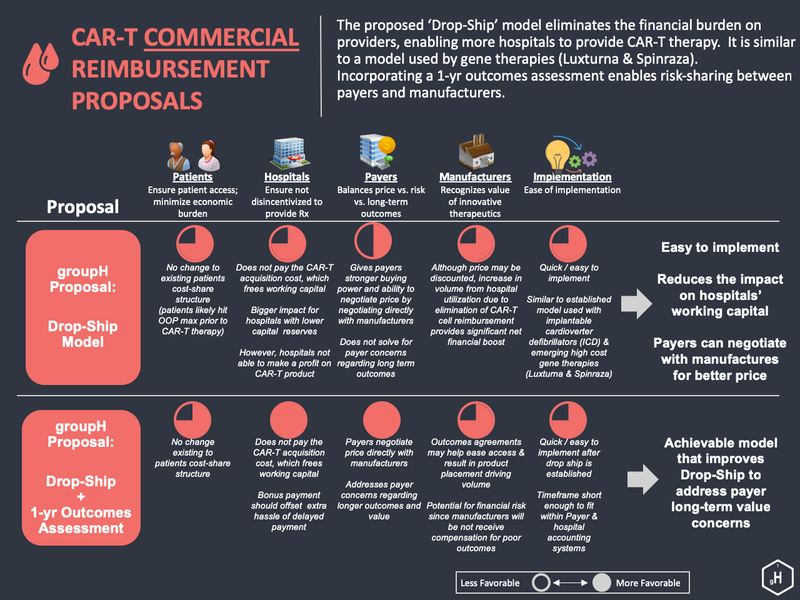 We also outline a ‘Drop-Ship’ model that could eliminate a provider’s financial burden, and draws parallels to the Spark Therapeutics reimbursement model that has been implemented for the gene therapy Luxturna. We also propose a method to incorporate a 1-year outcomes assessment to address the needs of Payers. We believe that these reimbursement issues are relevant to any company with a cellular or personalized therapy in development. A short infographic summary of the paper can be found below. To download a copy of the entire presentation please on the icon below, or email morris.paterson@groupH.com to arrange an in-person presentation with your team. The launch of hepatitis C (HCV) drugs such as sofosbuvir or ledipasvir has fostered the question of affordability of novel high budget impact therapies even in countries with high domestic product. European countries have developed a variety of mechanisms to improve affordability of such therapies, including ‘affordability thresholds’, price volume agreements or caps on individual product sales, and special budgets for innovative drugs. While some of these mechanisms may help limit budget impact, there is still significant progress to be made in the definition and implementation of approaches to ensure affordability, especially in health systems where the growth potential in drug spending and/or in the patient contribution to health insurance are limited. In this article, Nicolas Touchot, head of groupH’s Market Access practice, reviews how seven countries in Western Europe are approaching the question of affordability of novel therapies and are developing approaches to continue to reward new sciences while limiting budget impact. He also discusses the question of affordability of cost-effective but hugely expensive therapies and the implications for payers and for the pharmaceutical industry. groupH’s Market Access practice, headed by Nicolas Touchot, has recently been part of a collaboration to research the feasibility and attractiveness of indication value-based pricing (IBP) in key EU countries. Many targeted medicines are developed for different diseases and indications with common underlying biological mechanisms. The product benefit and therefore the ‘value’ is almost certain to vary by indication and by treatment. At present there is no system in place to allow payers to fully capture this difference in value found across indications. This could lead ultimately to products never being developed in an indication for which they could represent a major therapeutic advance, simply because this would lead to a lower price than that achieved or achievable in other indications. IBP has been proposed in the United States as a tool to address this issue, and is in the early phases of implementation there. However, in Europe, the picture is more patchy and implementation on a broader basis appears to be lagging behind the US. Our latest research assessed how the reimbursement and pricing environment could allow for IBP in seven European countries, evaluating both incentives and hurdles. Our findings suggest that broad implementation – including community-based practices – will be difficult in most countries covered, because of legal, data collection, and billing hurdles. However, implementation at a smaller scale and scope e.g. for specialty products in hospitals could be feasible because of much lower hurdles. Other mechanisms, such as use of managed entry agreements and volume-weighted average pricing defined through HTA outcome across indications, are likely to continue to be used to account for the difference in value across indications for most broadly prescribed treatments. We believe, however, that indication based pricing is here to come because it is attractive in principle to all stakeholders. For community-prescribed pharmaceutical products it currently still encounters logistical and IT challenges, but for hospital-based specialty products there is a good chance. This will be the area where we see the first pilots. Please click here to view the article, published this month in the Journal of Market Access & Health Policy. For more information, please contact Nicolas Touchot. https://grouph.com/wp-content/uploads/2015/09/WhiteP_P.jpg 230 290 grandchef /wp-content/uploads/2016/09/GrouoH-logo-master.png grandchef2016-05-01 13:49:582019-03-27 22:06:26Will indication value-based pricing become a reality in Europe? In the process of assessing novel healthcare opportunities, groupH recognises that the clearest picture comes from understanding the viewpoint of all stakeholders involved. By triangulating input from patients, healthcare providers and payers, we can provide the most granular and robust insights to best inform decision making and understanding from all stakeholders in value dossiers and payer discussions. In collaboration with Gensight¸ we are happy to share the results of our innovative patient research conducted with sufferers of Leber Hereditary Optic Neuropathy (LHON) and their caregivers. The findings of our research were presented at ARVO (1). LHON is a rare condition which leads to blindness and disability in teens and young adults. It is a disease not well known to payers. In fact, since treatment is spread across regional treatment centres and not concentrated in Centres of Excellence, the disease is not even that well known to many specialist doctors. In cases such as these, the perceptions of patients are vital to shed light on the key unmet needs associated with the condition, as well as to understanding what measures would most improve the quality of life of patients and their caregivers. groupH conducted creative and engaging focus groups across the US and Europe, with results illustrating the impact of the disease on the lives of patients and their families presented in poster format for scientific publication. Please click here to view the results in Scientific Poster format as PDF. Please click here to view the results in Word document format as PDF. 1 Leber Hereditary Optic Neuropathy (LHON): a qualitative study on the experiences and hopes of patients and caregivers. Presented at the Association for Research in Vision and Ophthalmology Annual Meeting 2015. 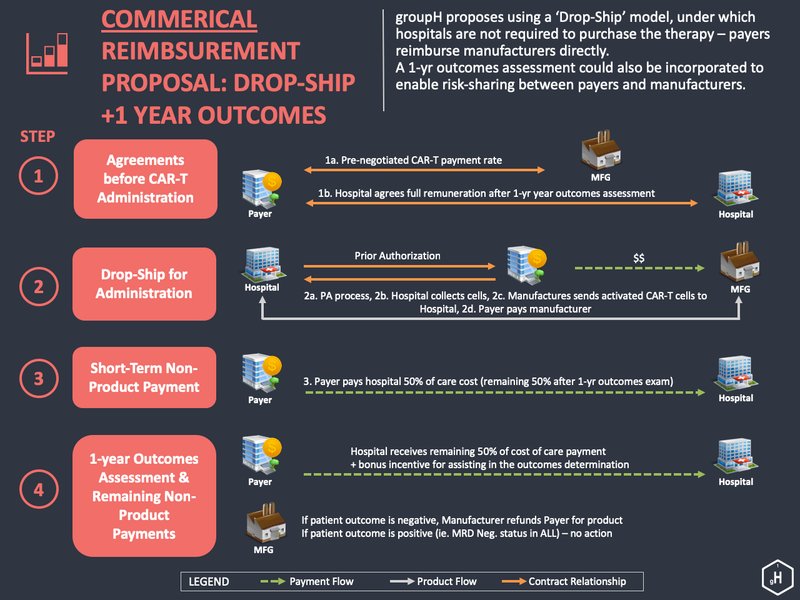 Market Access, and with it Pricing & Reimbursement models, has become an integral part of opportunity assessments for novel drugs and therapies. Nicolas Touchot, head of groupH’s Market Access practice, has looked into the feasibility and desirability of a number of reimbursement frameworks for gene therapies and potential other novel premium priced future therapies. Below is a summary of his article published in the September issue of Nature Biotechnology. In this article Nicolas Touchot from groupH, and Mathias Flume a leading German payer, detail why the payers’ view differs from that of other industry stakeholders, and provide alternative approaches developed through discussions with selected senior payers in the US and large European countries. groupH’s strategic Market Access practice reports favourable payer views on novel long-acting injectables. The Market Access team here at groupH, with permission from MedinCell, recently published a White Paper; revealing in-depth payers’ views on the prospects of value creation through novel long-acting injectables, the challenges associated with evidence generation, and the potential to translate value and evidence into favourable coverage decisions and pricing. Long-acting injectables (LAIs) have been around for a long time, helping in many indications to address unmet needs such as medication adherence and administration convenience. They have proved successful in a diverse range of disease areas, such as schizophrenia, acromegaly, alcohol addiction and endometriosis pain. However, up until now, greater utilization of LAIs has been impaired by limitations to the traditional delivery systems. These limitations can be addressed by a new generation of LAIs. The example of early strategic market access work that we describe here identifies business opportunities in this rapidly developing area. It also illustrates the specific complexities of payer/market access work and the impact these have on forecast assumptions. Our ‘real’ payer relationships, developed over many years, help us to gain clarity and prioritise potential business opportunities. As always, your views are very welcome. We look forward to hearing from you.